I can't believe that it is already the end of July. Not only is summer more than half over, it is also time for my monthly 12 Kits of Christmas post. If you are wondering what you have stumbled into, please click here for more information. This month's kit was generously provided by Christina of Sea Glass and Sentiments. Just take a look at all the goodies she sent. One of the most fun parts about this group is getting to play with stamp sets and dies I don't have, and this month was no exception. There were so many wonderful elements--die cuts, stamped images, and papers to play with--all in the traditional Christmas colors that I adore. It might be a bit of of a misrepresentation to say that I 'made' these cards, because, in reality, these cards assembled themselves. Honestly. Except for the focal point on this last card, which I cut and embossed using UTEE. So, I have to thank Christina for sending me a self-assembling card kit--the holy grail of our 12 Kits of Christmas group. As you go through this month's '12 kits' postings, you will see lots of poinsettias. A bit of trivia for you--what do you think is the poinsettia capital of the world? Give up? San Diego County. That's right. 80% of all the flowering poinsettias in the world get their start right here in San Diego. Did you know that? Now, for another little twist--leave it to Renee to come up with good ideas upon good ideas. Renee has challenged us to add an extra card every month that would be a CASE of another group member's card from a previous month. What a great way to use up the leftovers we have all been hoarding. She even put together a pinboard, where we can easily see all the cards we have made with this group. Check it out here--it's a great source of holiday inspiration. I chose to case one of Suzanne's card from Marybeth's April kit. I knew, the moment I saw this card back in April, that I wanted to try to make one myself. 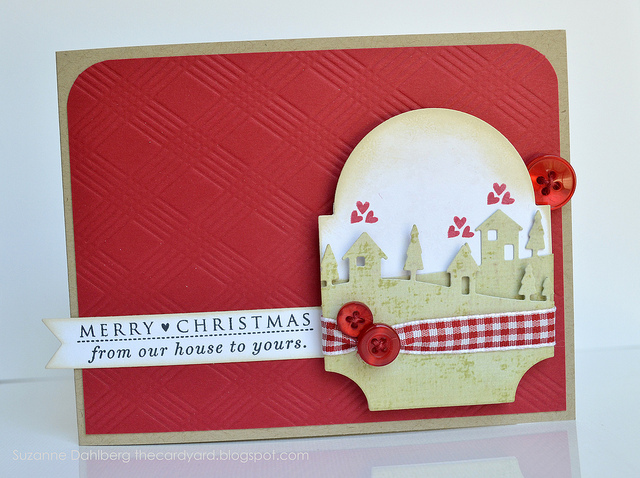 I just love how Suzanne cut the Memorybox Landscape die, and fit it on to a Mat Stack #3. I was able to use a sentiment and some paper included in this month's kit. I had such fun playing with all the goodies in Christina's kit, and now I am eager to see what everyone else has created. Thank you so much, Christina, for sending such a wonderful kit, and for giving your ingredients such great instructions about what to do once I unpacked them. If you are curious about anything used to make these cards, head over to Christina's blog, where she will have information on the supplies she sent. I fell in love with the sweet baby card Deanna made here, and just had to whip up my own version. Both cards use images from In the Jungle. The colors on the boy card are Spring Rain, Harvest Gold, Spring Moss and Aqua Mist. 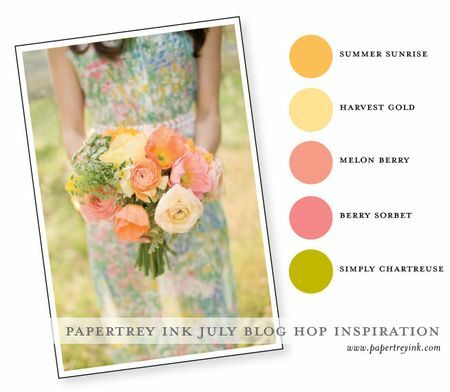 The colors on the girl card are Lavender Moon, Harvest Gold, Spring Moss and Aqua Mist. Which do you think is cuter--zebras or giraffes? 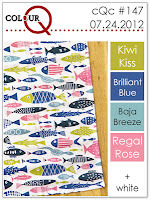 My card for this week's ColourQ #147 was inspired by this card by Susan at Simplicity. I used the PTI colors Simply Chartreuse, Blueberry Sky, Spring Rain and Hibiscus Burst. 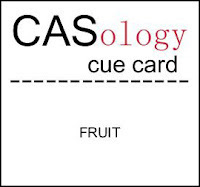 I have a sweet and fruity card for this week's CASology #3 challenge. I used UTEE on these strawberries, going over them a couple of times to get them thick and glossy. They really look scrumptious in person. A friend from tennis is retiring after many years as a flight attendant. 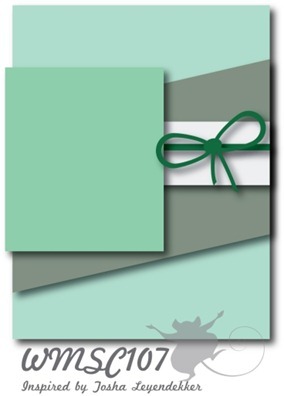 I was inspired by this card by Christina, to use the cute little airplane from Flying By for her retirement card. I am getting in just under the wire with my card for Retro Sketches this week. I don't know how the time slipped away from me. I am glad I made it, because how could I possibly miss making a card with this fabulous sketch from Tracey. This week's CAS-ual Fridays challenge has that old AC/DC song stuck in my mind. What a fun challenge, though, since I never use a black card base. I just bought some Lil' Inker dies, and thought it would be fun to play around with them, since they are the sponsors this week. I got the small and large sun, and decided to use them as bursts of color. Think fireworks or star bursts or some other explosion of color. I took my black card front, and cut the shapes out from all over the card. Then, I took die cuts in Summer Sunrise, Raspberry Fizz and Orange Zest and used them to plug up the holes. 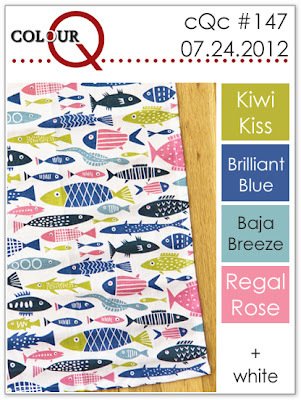 So, the card is entirely flat, except for my Paper Smooches sentiment, which is popped up with dimensionals. I thought that would be fun. I think you can see in this side view picture. I had another idea to use those suns as flowers. On this card, I glued the center of the die cut down, and pulled the 'petals' out a bit from the card. Stay tuned, because some day, I just may use these dies as suns, too. I decided to use Lovely Layers for my card, since I haven't used it too much yet. I went with the theme of flowers, and the same basic color scheme, only my colors ended up being much brighter rather than the soft shades of the picture. I think I am just a bright colored gal. I like the card I ended up with, although it doesn't resemble the picture much. But, the picture did inspire me, and that is the main point, right? And, if you don't mind more pictures, I've got some pictures from Stamp-A-Faire. 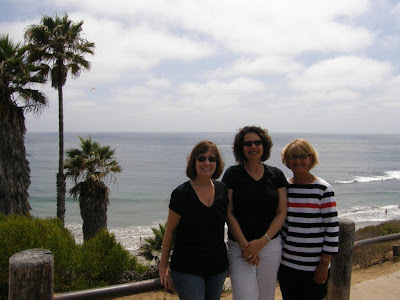 I was lucky enough to have two dear friends come over for the day, Kim from Cupcakes, Cards, and Kim and Cathy from Empty Nest Crafter. I won't show my cards, since we were so busy talking and laughing, that I really didn't do much other than case a few of the DT's creations. Here we are on a break from crafting--I took them to the beach near my house. Kim and I each made favors for each of us from Favor-it dies. Cathy had the most beautifully wrapped basket of strawberry themed crafts and gifts. This is what was left of it after I tore it open. I should have taken the picture first. She actually made paper strawberries with little gifts inside each one. 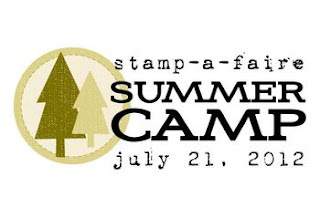 Stamp-a-Faire was a day to remember. We had such fun, and still managed to watch a number of the videos and create a couple of cards, too. I sure hope it becomes an annual tradition. 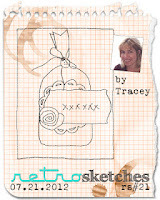 I have a quick post for this week's Waltzingmouse sketch challenge #107. Can you tell I am loving My Island? 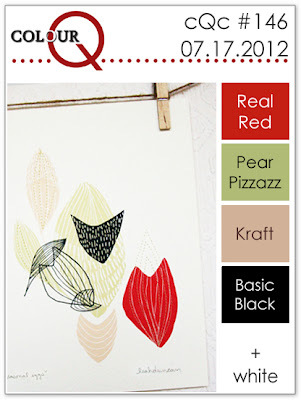 I just love this week's ColourQ #146 colors, which for me are Pure Poppy, Simply Chartreuse, Kraft and Black. I think I could create all week with just those colors. But, time is short, so I have one card today. I am pretty sure that the Washi Tape trend must be coming to an end. How do I know that? Well, because I finally caved and got some. I used this Washi Tape from My Minds Eye called Indie Chic Pictures Tape, and combined it with my latest stamp purchase from Avery Elle, Framed Fonts. I created this card below, which was inspired by a card from one of the Hero Arts blogs that popped up in my reader yesterday, but I can't seem to find today. Oh, well, sorry. The borders are from Lawn Fawn's Belinda's Borders set. 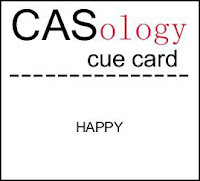 Have you heard about the newest challenge blog, CASology? This is their second week, and the word of the week is 'HAPPY'. What makes me happy? 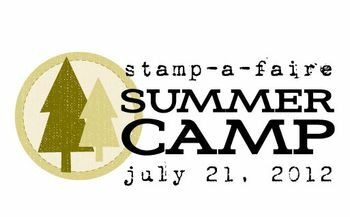 Well, lots of things, including new stamps. I just got my first stamp set from Avery Elle, Framed Fonts, and I decided to make a Happy Birthday card with it. Hopefully, I will make someone happy when they receive this card.